"A Translunar Laboratory . . . Hurrah!" One of the great “perks” of being a scientist and a science fiction fan is meeting other scientist-fans from fields other than my narrow research specialty. Sometimes, we even get to discuss the type of science that turns SF into reality. Thus I found myself invited to the Second Tennessee Valley Interstellar Workshop (TVIW) held in Huntsville, AL, in February of 2013. I was invited by workshop organizer Les Johnson -- himself a scientist-writer for Baen. I had been invited to supply some biology-based insight into discussions of how to make the dream of interstellar exploration come true. For my first foray into that realm, I was not entirely sure what I had to offer. However, in a panel discussion of projects that we (humanity) should target for the next 5-10 years, I mentioned the need for a biomedical research laboratory to investigate questions that have been unanswered or only partially answered by the limited experimental space in the Space Shuttle payload bay or in the International Space Station (ISS). To my surprise, the idea was well received, and I was given the charge to report back to the Third TVIW with a more complete description of that proposed laboratory. Apollo Astronaut David Scott is reported to have said "There's nothing like a little science ... on the moon." One of the problems with the biomedical science conducted across 50 years of Mercury, Gemini, Apollo, Skylab, Shuttle and ISS has been that it is indeed “little science.” By this, I mean that the science is conducted under very limited conditions, limited space, limited numbers, and with only small organisms (bacteria, plants, fruit flies, mice, etc.). To change that would require a dedicated laboratory with space for larger numbers of animals, larger animals, and capable of answering the “big questions” of human spaceflight. Thus, in November of 2014, at the Third TVIW in Oak Ridge, TN, I reported to the assembled group of scientists, engineers and writers with a talk entitled "There's Nothing Like a Little (Biomedical) Science ... in Space!" The outer space environment is hazardous to multicellular life. Planet-bound life evolves in an envelope of pressurized gases, with a constant force of gravity that always points in the same direction, and with protection from solar and cosmic radiation by virtue of a deep atmosphere and planetary magnetic field. Hence, two of the biggest problems that face astronauts are microgravity and radiation. The problem with collecting experimental data on Earth is countering the constant 1g gravity field on Earth's surface and artificially producing the types of radiation encountered in space. In the ISS, we do collect plenty of data on physiological effects of microgravity, but at the same time, ISS space limitations rule-out generating an environment to determine whether spin- or acceleration-induced artificial gravity will counter those effects. At the same time, the ISS is in Low Earth Orbit (LEO) at just over 400 km altitude and just not exposed to the full extent of radiation that will be encountered on the Moon, on Mars, or anywhere else in or out of the Solar System. So ... what do we need to study, and how do we go about building appropriate laboratory facilities to do those experiments? Prolonged absence of gravity causes many changes in mammals -- the bones lose calcium; muscles are reduced in mass and strength and alter their endurance; fluid within the body redistributes to cause swelling of the face and head; blood volume and composition is altered; the heart reduces in size; vision is altered by increased fluid pressure. These changes are long-lasting: muscle weakness can last for weeks, vision problems for months, and bone and heart problems can last for years. To date, no drug treatment, exercise, therapy or intervention has prevented the process, even though there are many procedures instituted on the ISS such as compression garments and resistance exercises that slow down or lessen the effects. This is one reason why ISS stays have been limited to 6 months, although the first 12 month mission will commence in March this year. Given that a mission to Mars is anticipated to last three years, with half of that time spent in transit from and to Earth, it is essential that we learn more about how to prevent and/or recover from long-term effects of weightlessness. One of the methods long proposed in SF is artificial gravity induced by spinning part or all of an interplanetary/interstellar spacecraft. While scientist and engineers theorize that spin-induced gravity will suffice to slow or prevent calcium loss, muscle weakness and fluid-pressure problems, the truth is, we don't really know because we have not set up laboratory conditions to test the theories and models. There have been small-scale experiments on the ISS using compact centrifuges to determine how plants, insects and mice react to spin-induced gravity. However, the ISS is just not large enough to build a human or even large-animal-sized centrifuge. It is important that such a centrifuge be of sufficient diameter to allow a bipedal mammal to stand upright, such that the long bones of the legs and arms, the spine, and the postural muscles all receive the full benefit of the artificial gravity. If the radius of the centrifuge is too short, there will be considerable gravity and angular momentum differences between the head and feet of a standing human! One proposal for a compact, human-sized centrifuge “arm” on the ISS would have only been large enough for a human to lie down, and was proposed as sleeping quarters; however, as stated above, it would not provide the full bone and muscle benefits of a large radius centrifuge. We also do not know whether spin-induced (centrifugal) gravity will be a sufficient replacement for planetary gravity. On Earth, gravity is essentially a uniform field. Due to the large diameter and mass of Earth, its gravity field is constant and always downward, no matter how you move within that field. Centrifugal gravity is a result of acceleration -- objects moving in a circular path may move with a fixed velocity, but the fact that the direction of travel constantly bends away from a strict linear path means that the angular momentum is experienced as constant acceleration. This acceleration has a direction, and any movement in a different direction can experience torsion in the form of Coriolis forces. The human inner ear maintains our equilibrium by sensing angular momentum changes of our bodies within Earth's constant, unidirectional gravity. We know that humans experience vertigo in the absence of full gravity, but they also have similar experience of vertigo in large Earth-bound centrifuges caused by Coriolis forces in the inner ear. Consider how dizzy you get from trying to turn your head on merry-go-rounds and looping roller coasters! One of the great unknowns of using spin-induced gravity for space travel is how well humans will tolerate it. We also need some experience with different sizes (or levels) of centrifuge to determine how much gravity we need, and whether full-time or part-time exposure is needed. These latter questions are quite important -- if we could somehow determine that “X” hours of centrifuge a week can reduce or eliminate bone and muscle changes, it would tell us how well humans can tolerate long-duration space missions and maintain their health. It is also an important consideration for the return to Earth and consequences of re-entering Earth's 1g field. Given that extended missions to the Moon and Mars would involve months at less than 1g (Moon gravity = 0.16G, Mars = 0.37G), we also need to know whether the full health benefit requires 1g, or whether any fractional gravity will do. Given that the necessary artificial gravity research cannot be conducted on Earth or ISS -- what kind of laboratory is needed? 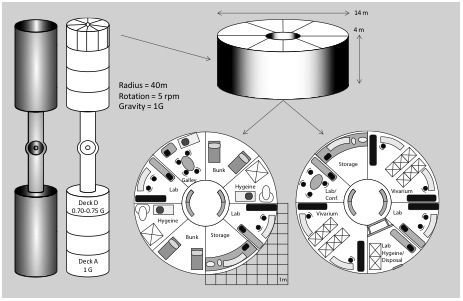 I propose the following requirements for an orbital laboratory: It needs to be at the very least in High Earth Orbit (for radiation studies, as further described below), it needs to be “livable” in that both humans and lab animals spend all of their time within the habitat, and it needs to have a short enough radius to allow research at different gravity levels, but long enough radius that a standing human feels no differential gravity at any level. The habitat would consist of a stack of “tuna can” modules, each of which would provide approximately 175 cubic meters of living space, and 175 cubic meters of laboratory space per module. Each deck would measure approximately 14 m radius by 4-5 m height. While only 2.5 m would be necessary for habitation, the additional height would be for shielding, water, air, electrical cabling and machinery to allow each module to function independently. Laboratory units would be approximately 16 meters squared, surrounding a central core. For animal research modules, the living space would be converted to vivarium facilities for housing laboratory animals. The human researchers can serve as both experimenter and subject depending on the study, and thus would be expected to live full-time in the laboratory habitat. This design allows 3-4 modules or decks to be arranged at each ends of a common spindle, often called a “tin cans and string” design. The entire habitat would have a radius of 40 m and rotate at 5 rpm to produce 1g on the outermost deck, and approximately 0.7g at the ceiling of the inner deck. This rotation necessitates that the ends would rotate at 21 m/s or about 45 mph. The radius and rotation speeds are important for studying Coriolis forces on the inner ear. Slowing the rotation of the habitat to just 3 rpm requires a radius of 100 m, resulting in rotational speed of 31 m/s -- nearly 70 mph on the outer deck. The laboratories will be able to assess cognitive abilities (memory, decision-making, stimulus discrimination, sleep functions) of the humans and lab animals, measure physiological changes, perform surgical procedures, provide controlled atmosphere and pressure, and perform biochemical, histological and microbiological tests. In comparison to current ISS experiments which are limited to very small animals, this laboratory should be able to handle larger animals, up to and including nonhuman primates (rhesus monkeys). As a neuroscience researcher, I feel it is necessary to include primates as a stand-in for humans in certain experiments. Only primates spend as much time upright (bipedal) as humans, and only primates exhibit the full range of physiological and neurological responses to the environment as humans. The laboratory habitat will need to be in an orbit to be readily resupplied from Earth. Laboratory animals will require their own diets, and obviously, larger animals will consume proportionally more resources than small animals. In addition, animal and human wastes should not mixed in closed habitat recycling systems. Fortunately in space, wastes can be desiccated in vacuum and sterilized with exposure to solar radiation. However, this means that the laboratory will need regular resupply from Earth -- this can be readily accomplished in low Earth orbit -- but is LEO the best location for the lab? Aside from effects of artificial gravity there are many other biomedical issues that can be studied in a space laboratory. Although there have been several attempts to do so on Earth, one of the advantages of a well-equipped orbital laboratory is the study of animal and human adaptations to lack of circadian (day-night) cues and sufficiency of closed environments. Laboratories such as MARS 500 (http://www.space.com/13500-mock-mars-mission-mars-500-ends.html) can simulate the isolation and limited contact between an interplanetary mission and Earth, but the laboratory always remains on Earth, with considerable safety and backup. In addition, many of these laboratories have been flawed (http://www.nytimes.com/1996/11/19/science/paradise-lost-biosphere-retooled-as-atmospheric-nightmare.html) in not being truly “sealed” from the Earthly biosphere. Even on the ISS, Earth is just a re-entry burn away. On the other hand, if the orbital laboratory is in High Earth Orbit (HEO), or at a LaGrange Point, any “rescue” attempt will require orbital matching and trajectory calculation to pick up a sick or injured animal or human and return them to an Earth-based facility. Thus, an HEO location for the laboratory habitat begins to simulate more of the self-sufficiency required for a long-duration mission, while still providing the potential to return personnel to Earth if absolutely necessary. This is one reason why it might make more sense to base some of the laboratory functions on the Moon, except for the artificial gravity constraints. At least with respect to the isolation and self-sufficiency, a Lunar colony may make more sense for biomedical research -- provided it can be studied at 0.16G. However, one aspect of a Mars mission or even interplanetary/interstellar travel cannot be studied even in geostationary orbit or on the Moon -- radiation. Figure 2 shows the influence of Earth's magnetosphere, the magnetic field produced by Earth's rotating metallic core, which traps or deflects much of the solar and cosmic radiation away from LEO and the Earth's surface. The majority of Earth's magnetosphere (red circle and shading) extends to an altitude of approximately 57,000 km above the Earth. LEO is considered any orbit above the atmosphere, out to 1,000 km. Most Space Shuttle orbits were quite low -- about 300 km -- with the ISS orbiting at a likewise low altitude of 430 km. The well know “geosynchronous” or “geostationary” orbits of communications satellites in HEO (white) are still well within the magnetosphere at 35,000 km altitude. The magnetosphere does vary its shape based on the intensity of the solar wind and energetic events on the Sun's surface. However, most of that distortion affects the bow shock (orange) and magnetotail (green) which define the limits of the magnetosphere to deflect charged particle emanating from the sun. 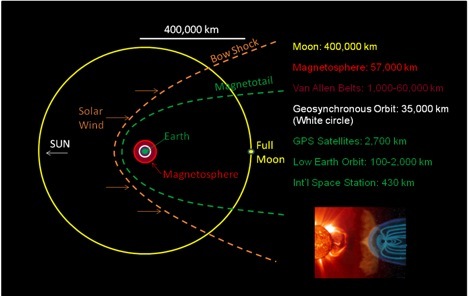 The well-known Van Allen Belt(s) define the core of the magnetosphere which protects LEO and Earth's surface from radiation. The VAB consists of charged particles (electrons and protons/hydrogen nuclei) trapped by the magnetosphere from an altitude of 1,000-60,000 km. Photons -- in the form of light, x-ray and gamma radiation -- are not affected by magnetic fields, and must be blocked by shielding which mimics the effects of Earth's 100 km -thick atmosphere. HEO and the VAB are the province of shielded satellites and exploratory probes. No American astronaut has ventured above LEO since 1971. In fact, only 27 Americans have left the protection of Earth's magnetosphere -- the crew of Apollo 8 in 1968, then Apollo 10 in 1969 to Apollo 17 in 1971. The Moon, as shown in Figure 1, passes in and out of the extended magnetic envelope, the magnetotail, transiting the region in about 6 days every full moon. Given that Apollo moon landing missions were scheduled to overlap the full moon for communications and solar illumination, no astronaut may in fact have ever experienced the full impact of solar and cosmic radiation! For this reason, perhaps a better location for the laboratory habitat would be one of the Earth-Moon LaGrange points -- L4 and L5, in the same orbit as the Moon, or at L2, located directly opposite Earth about 60,000 km higher than the Moon's orbit. All three locations would provide periods of full exposure to the Sun as well as 6-8 days in the magnetotail each month. L2 provides the additional benefit of shadowing by both Earth and Moon as well as a longer shadowed period than L4 and L5. This advantage is offset by a less stable orbit and greater distance and difficulty in transit from Earth and LEO facilities to L2. Why is it important to have a laboratory in a position to study the effects of space radiation? We know the obvious connections between radiation and alteration of mammalian cells: blood forming cells, immune system and cancer risk. However, solar and cosmic radiation are very hard to simulate on Earth. The only facility in the U.S. capable of delivering radiation which comes close to the composition of the cosmic radiation is the National Space Radiation Laboratory at the Brookhaven National Research Lab particle accelerator. The radiation most frequently encountered on Earth, x-rays, consist of photons -- essentially light waves in the 0.1 nm wavelength, 1 exahertz (10^18 Hz) frequency. In comparison, visible light ranges from 400-700 nm, in the 100 terahertz range. Even gamma rays are simply (!) a more energetic variety of light, at picometer (~10^-12) wavelengths and zettahertz (~10^21) frequencies. Solar radiation, in comparison, is light plus electrons, plus a plasma comprised of atomic nuclei that have been stripped of those electrons. The most common particles are protons from hydrogen nuclei, but also include helium, oxygen, silicon, cesium and even lead atoms consisting of only protons and neutrons stripped of electrons. The high positive charge of these particles is one reason why the Earth's magnetosphere deflects or captures the energetic particles. The key difference between the solar wind and galactic cosmic radiation is in the proportion of heavy charged particles. Solar wind is about 85 percent protons, with the remainder as electrons and positrons. Helium nuclei are rather rare, accounting for less than 1 percent of the total. Heavy particles are extremely rare (less than 0.001 percent) and mainly released by flares. Cosmic radiation differs from solar wind only in the proportion of heavy ions, with slightly less helium, and comparatively more oxygen, silicon and iron. Even with this increase, cosmic rays still contain less than 0.1 percent heavy ions. Surprisingly, what is largely absent in solar and cosmic radiation is neutrons. We know that neutrons are released by nuclear fission and to a lesser extent by nuclear fusion reactions. On Earth, neutrons are readily captured or shielded by water, organic polymers or boron-rich glasses and ceramics. In solar fusion, energy levels are high enough to convert free neutrons into protons (with the release of an electron and neutrino), thus the relative absence of neutrinos in solar and cosmic radiation. The high gamma radiation flux, however, introduces another factor that neutrons can be produced by “spallation" or gamma-induced isotope decay from materials used for shielding. More research is needed in the actual environment, and not just what can be simulated on Earth! I had the privilege of recently attending a NASA meeting on space radiation research. I can attest to the fact that effects of solar and cosmic radiation on the human body is one of great concern. Radiation effects on the blood-forming organs, bone, connective tissue and immune system are well known and under scrutiny. However, most of the research is Earth-based, with the primary concern for astronauts being that they are adequately shielded from radiation on Shuttle flights and the ISS. As described above, however, solar and cosmic radiation are complex entities consisting of multiple types of radiation, constantly varying as a result of galactic and solar events. The primary source of radiation for research is the particle accelerator at Brookhaven, and preparation of animal experiments must share time with all of the other high energy physics research performed at the National Laboratory. Effects of radiation vary by the type of radiation (with x-ray and gamma rays being the “simplest” to high energy heavy nuclei with produce physical as well as radiation damage in living tissue. Figure 3 shows a comparison of radiation levels (for x-ray and gamma radiation) from background to fatal does. The smallest amount of measurable radiation on this chart is the “Banana Equivalent Dose” (BED) -- the amount of gamma radiation released by potassium-40 (K) decay in a single ripe banana -- cited to assure the public that small background radiation exposure is normal and healthy. Other doses shown are in units of “Equivalent Dose,” or Sieverts, used to compare the energy of various radiation sources. For this purpose, Equivalent Dose is also equal to “Absorbed Dose,” usually listed as Grays, which compare the effectiveness of radiation doses on living tissue. For x-rays and gamma rays, 1 Sievert (Sv) = 1 Gray (Gy). The old terminology and unit of measure “Roentgen Equivalent, Man,” or REM, is proportional to Sieverts, with 100 REM = 1 Sv. It can be seen in Figure 3 that many sources of radiation encountered in normal circumstances convey negligible risk to humans. However, even the relatively short duration of ISS missions carries a much greater risk from radiation exposure. It should be noted that at exposures of greater than 0.25 Gy/0.25 Sv, there is a risk that brain processes may be altered. It is known that whole brain irradiation totaling as little as 5 Sv in the course of cancer treatment can result in degradation of memory and cognitive decisions in humans and nonhuman primates (http://www.ncbi.nlm.nih.gov/pmc/articles/PMC3747826/). In rodents, the threshold for such decrements has shown to be as low as 0.25 Sv! It is this risk of radiation-induced cognitive decline that most concerns neuroscientists: It is only recently (http://adsabs.harvard.edu/abs/2010cosp...38.3174H) beginning to gain traction with the space radiation research community, yet has the potential to eclipse the risk of cancer on long duration space missions. 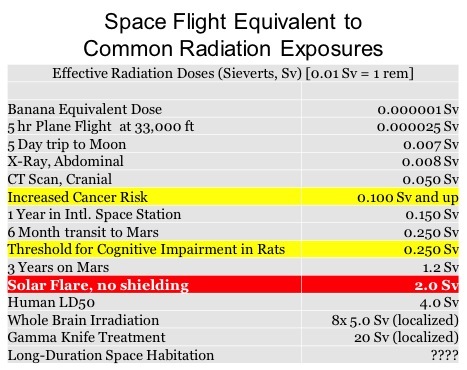 Research into effects of space radiation can be performed on Earth, but it is limited by the number and size of animals (Brookhaven will not treat any animals larger than rodents), by simulation of the composition of solar and cosmic radiation, and by availability of the radiation facilities. A High Earth Orbit or LaGrange-orbit lab would allow controlled exposure to actual space radiation in a realistic context, as well as testing the various types of proposed spacecraft shielding. It is also highly necessary to include high-order nonhuman primates in the laboratory to provide the best analog for human physiological and neurological assessment without risking the astronauts themselves. One would hope that the need for a space laboratory would be obvious based on the number and type of investigations that must be performed in the actual context of space missions. Neither artificial gravity nor effects of space radiation can be completely simulated on Earth or ISS. Research does and will continue. In March, NASA will launch the first astronauts to spend 12 months on ISS. Only three humans, all Russian Cosmonauts, have spent 365 or more continuous days in a single mission. The longest single spaceflight was by Valeri Polyakov who spent 14 months on Mir when ground problems delayed the relief crew. These heroic missions pale in comparison to proposed 1000 day missions to Mars and back. Astronaut Scott Kelly, one of the two 12-month mission astronauts, will participate in a number of biomedical tests using his Earthbound twin, Mark Kelly (husband of former Congresswoman Gabrielle Giffords) for comparison. Both Kelly's are astronauts (Mark is retired) but by the end of the upcoming mission, Scott will have experienced 540 days in space to his twin's 54 days. The situation provides the unique opportunity to examine orbital experience with a fixed “control specimen” on Earth. As amazing as the plan and opportunity represented by the twin study may be, it points out the primary justification for putting a biomedical research laboratory into space: We must stop using our astronauts as our sole research subjects. Time on the ISS is limited, and research programs must compete for the (limited) time in an astronauts schedule. In addition, astronauts are not necessarily the best test subjects -- they are selected by processes that could weed-out factors critical to physiological effects of spaceflight for the rest of humanity. A dedicated lab would allow more time, more variety, and more appropriate conditions for experimentation. The greatest risk humanity faces in the exploration of space is for our astronauts to reach Mars with failing bodies and minds. We must not risk our ability to “boldly go” ... because we failed to adequately research the conditions necessary to get there. Tedd Roberts (pseudonym) is a neuroscientist who studies the effects of drugs and disease on memory and cognition. His research ranges from rodents to humans, from amnesia to epilepsy, and from brain injury to restoration via "neural prosthetics." Dr. Roberts writes short fiction as well as nonfiction/science articles for the SF/F community. His other articles for Baen Books are available in the Baen Free Library at http://www.baenebooks.com/c-1-free-library.aspx, Free Nonfiction 2012, 2013, 2014.